Michael Sammes made numberous recordings in the 1960s of highlights from musicals and operettas. 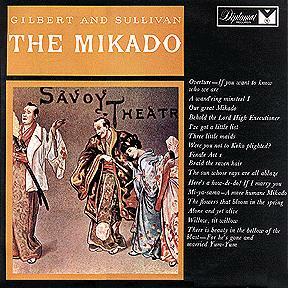 His G&S output includes several discs dedicated to individual operas, plus a Best of Gilbert and Sullivan disc consisting of highlights from all the others. The singers are not credited with specific roles, but presumably Sammes sang Ko-Ko. 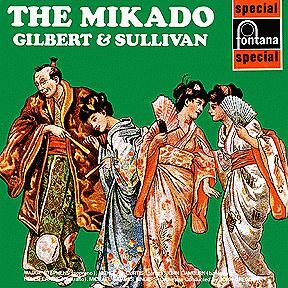 Eric Wilson-Hyde was never a member of D'Oyly Carte, but he made a guest appearance as Bob Becket, the Carpenter's Mate on the 1960 Pinafore, so presumably he sang either The Mikado or Pooh-Bah. 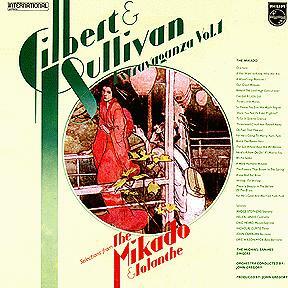 Helen Landis was the contralto on all the Gilbert and Sullivan For All recordings. The Finale to Act I lasts just 4 minutes and ends just before Katisha's "The Hour of gladness." The individual principals are acceptable enough — particularly perhaps the soprano and the tenor — and some items emerge quite creditably. The performance suffers from the lack of a proper chorus, although the overall effect is not so slinky and creamy as the Michael Sammes Gondoliers. A one-word summing up would have to be "bland," and this recording could not be used to persuade anyone of the excellence of G&S.